Welcome to Math Salamanders Math Worksheets Kindergarten Counting Sheets. Here you will find a wide range of free printable Kindergarten Math Worksheets, which will help your child learn to match numbers of objects up to 10 with their values. Here you will find our range of kindergarten worksheets which will help you child learn to count and match numbers. The following worksheets involve using accurate counting skills. Counting is one of the key skills that children learn at an early age using physical objects. This skill is one of the basic building blocks of Math. For the learning in First Grade, and beyond, to be successful, children need to be able to count confidently sets of objects. It is important for children to experience counting in lots of different ways, from counting real-life objects to counting pictures of things to counting in their heads. The sheets involve counting and matching a range of objects and animals and are available as a color or black and white version. The sheets are carefully graded so that the easier sheets come first and the level of difficulty gets gradually harder. The sheets cover the following areas: counting up to 6, counting to 8, and counting up to 10 objects. match different sets of objects with numbers up to 10. All the Math sheets in this section support the Elementary Math Benchmarks for Kindergarten. The worksheets in this section cover counting and matching numbers up to 5. There are a range of different matching and counting activities to meet your needs. These kindergarten worksheets are all about recognising and counting coins: pennies, nickels, dimes and quarters. The sheets involve recognising both faces of each coin. 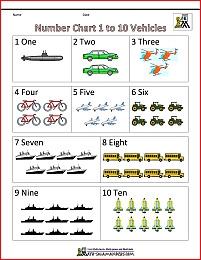 This page is all about ordinal numbers: first, second, third, etc. There are a range of worksheets to help your child understanding how to use ordinal numbers. Lots of reading, writing, coloring and finding ordinal numbers with an animal theme. These sheets are a perfect way to start kindergarten kids off with their learning.